For the past several years, I’ve been following the consultation process that Port Metro Vancouver is working through for its proposed 190 hectare Roberts Bank Terminal Two expansion which will add 2.4 million TEU of container handling capacity to the port by 2024 in South Delta. Earlier this year, the Port released the results of its first round of public consultation on the proposed project which included feedback from participants. In most consultation processes, once input is received, it seems to go into a black hole never to be heard from again. A participant really has no idea if her or his input was used. This is why I was pleasantly surprised when I saw that Port Metro Vancouver has released a “Consideration of Consultation Input” document. Preserving the environment is a core value for Port Metro Vancouver. Our programs work to minimize impacts of port operations as well as enhance the surrounding environment. As the first North American port to employ a dedicated team of specialists to address issues concerning the environment, Port Metro Vancouver shares this vital responsibility with Transport Canada, Environment Canada, Fisheries and Oceans Canada, Metro Vancouver, and with the support of other local organizations. We are committed to operating in a responsible manner to safeguard the environment and the health and safety of our employees, customers and the public. The Port responded to many of the concerns brought up in the consultation by essentially saying that it may study the issues further, and could implement mitigation measures based on the results of the studies. It appears that the Port will be working on a collection of baseline condition studies on the marine environment, agricultural productivity, transportation network, light pollution, noise pollution, and air quality. The Port will use these baseline studies to model how the proposed port expansion will impact the baseline, and hopefully proposed and implement mitigation measures. While there are few direct action items that the Port is undertaking as a result of this consultation phase, the Port does plan to do something about noise. Many residents that live in the area are concerned about the noise that the Port will produce during and after the construction of the expanded terminal. The Port plans to install noise monitors in the area. I’m happy that the Port has decided to respond to the concerns and questions raised during the consultation, and I hope that the Port will continue to follow up in addressing the concern raise once it has finished its baseline studies. I would like to see this kind of followup from other organizations that engage in public consultation like local governments, the Province, and TransLink. Last week, I posted about how the City of Langley was very excited to be getting a new auto dealership at the corner of Glover Road and the Langley Bypass. The City described the architecture of the dealership as combining “simplicity and elegance in a modernistic expression.” From how the City described this proposed auto dealership, one might assume that this is a special one-off design for our community. As it turns out, it's just the standard concept design for the auto brand. 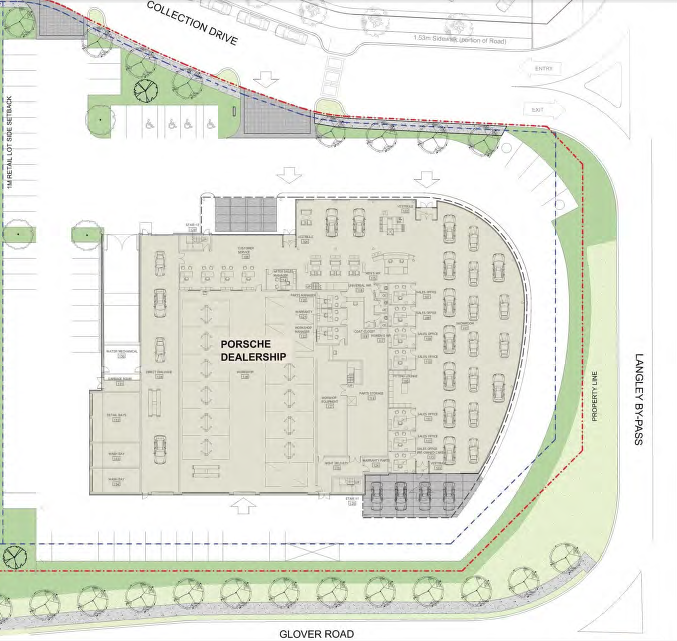 The proposed Langley dealership is an exact copy of a dealership which is being built on Terminal Avenue in Vancouver. I see it every weekday as I take the SkyTrain into work. Many municipalities try to discourage concept designs as they feel it takes away from the character of their community. 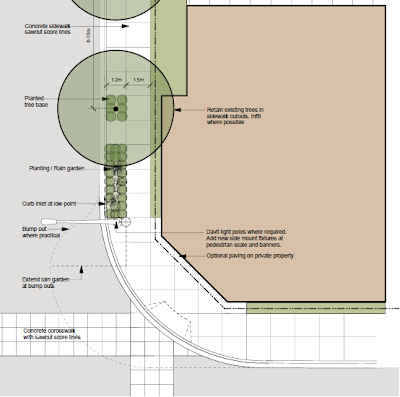 For example, Surrey doesn't allow gas stations to use standard concept designs, and Fort Langley has very specific design requirements that also prevent the use of these standard designs. 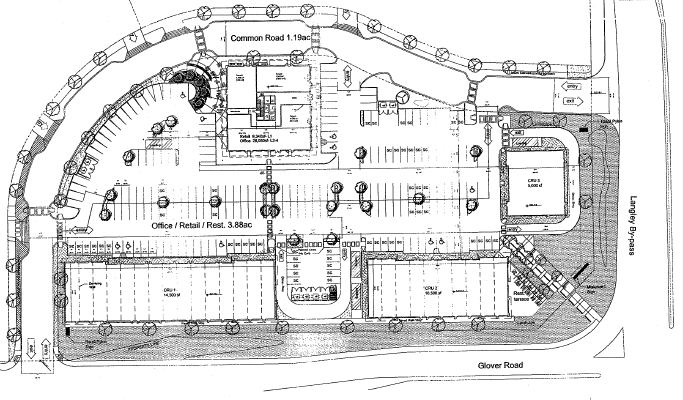 There was one odd thing that I noticed when I looked at the site plan for the auto dealership last week; bicycle parking. I thought it was odd that an auto dealership would include bicycle parking, unless of course they were hoping people would arrive on bike and leave by car. As it turns out, the City of Langley actually has minimum bicycle parking requirements, just like it has minimum car parking requirements. For any mode of transportation to be successful, it needs to have trip terminal facilities and the actually infrastructure for travel. For SkyTrain, you need stations and a guideway; for driving, you need parking and roads; and for cycling, you need bike parking and bike lanes. The City of Langley’s policy to require bicycle parking is meant to encourage cycling and make it a viable transportation choice. Unfortunately, many places in Langley are hostile for pedestrians, cyclists, and transit users because they are design for cars and not people. I don’t know many people who would take a bike ride along the Langley Bypass. It’s great that the City requires bicycle parking, but it also needs to build the travel infrastructure like protected bike lanes and off-street paths to truly make bicycling a viable mode of transportation. The City also needs to develop zoning that encourages walking, cycling, and transit use. As I posted about yesterday, there is work that needs to be done. I looked into the Township of Langley’s zoning bylaw and it doesn’t appear that it has a minimum bicycling parking requirement. When looking at the walkable places that we love in Langley, there is one thing that they have in common. They all would not meeting the minimum off-street parking requirement if these places where built today. For example, under current City of Langley minimum parking requirements, the built form of the Downtown Langley core would not be possible. 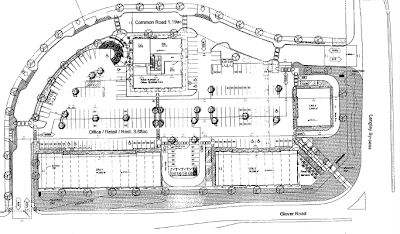 If a business owner or land developer wanted to construct a new building, they would need to have the same parking requirements as the Langley Bypass. For retails uses, the bylaw requires about 3 spaces for every 1000 square feet of retail floor space. Put another way, the City of Langley requires 713 square feet of parking for every 1000 square feet of retail floor space! The City of Langley even allows surface parking lots in its Downtown zone, so it's no surprise that we get projects like the casino which actually destroy the walkability of Downtown Langley. The Township of Langley requires about 4.5 parking spaces for every 1000 square feet of retail floor space in all parts of the community except for Fort Langley which is 50% of the standard requirements. At 2.25 parking spaces for every 1000 square feet, the parking requirement is still onerous. The thing about off-street parking requirements is that they are arbitrary. Why does Downtown Langley, which is on the frequent transit network and within an easy walk of higher density housing, have the same off-street parking requirements as the Langley Bypass? It makes no sense. Do you know where the City and Township of Langley get their parking requirements from? The requirements are likely directly or indirectly from the ITE Parking Generation Manual which is based on limited samplings of parking use in auto-oriented areas. Ironically, the manual shows weak correlation between the square footage of use space and needed parking. If you look at walkable places like Fort Langley and Downtown Langley, they function because buildings do not meet the minimum off-street parking requirements. Minimum off-street parking requirements are limiting and killing infill development opportunities and restoration projects that would improve the walkability and vitality of areas like Fort Langley, Downtown Langley, and Aldergrove. Parking spaces aren’t cheap, an underground parking spot can cost between $20,000 to $40,000. This cost limits the viability of build walkable one or two-storey retail/mixed-use buildings. A major renovation of a building in Downtown Langley could trigger the City's onerous off-street parking requirements. In Vernon, where I grew up, the city had no off-street parking requirements in the Downtown core. The City used parking meters to regulate on-street parking. I strongly believe that both the City and Township of Langley need to examine their minimum parking requirements in their walkable cores if they truly care about preserving and growing these special places. As I’ve posted about in the past, Metro Vancouver is responsible for the management of solid waste in our region. It has the goal of diverting 70% of all waste generated in the region from going to a landfill by 2015, and has set an 80% diversion target by 2020. These are ambitious targets, but it appears that the region is on the path to meeting them. Besides supporting recycling collection throughout the region, Metro Vancouver has just introduced organics collection regionally. Right now, most single-family homes have organic waste collected which ends up at regional composting facilities. Organics collection will be coming to multi-family housing (apartment and townhouses), commercial buildings, and institutional sites by 2015. One the recycling front, complexity has been added to the system due to changes in Provincial regulations. In 2011, the Provincial Government changed recycling regulation to shift the responsibility of recycling product packaging and printed paper to industry. Multi-Material British Columbia is the non-profit society setup by industry to manage the program which will be fully operation by 2014. While more material will be included in this new program, there are some challenges. Multi-Material British Columbia is hoping to sign collection agreements with local governments and pay them a fee to collect packaging and printed paper recycling at the curb side. Some local governments feel that the payment being offered does not cover the cost of collection. Also, Multi-Material British Columbia is considering not collecting glass and plastic films at the curb; only accepting them a depots. This may reduce the recycling of glass as it is currently accepted at the curb today. Also, the program also does not address commercial or industrial recycling. There are some details to be worked out, and hopefully this program will see an increase in recycling and not a decrease. For the 20% to 30% of material that will still be landfill-bound, Metro Vancouver is looking to build a new waste-to-energy facility in the region. Right now, Metro Vancouver has short-listed ten companies that could build and manage a waste-to-energy facility. 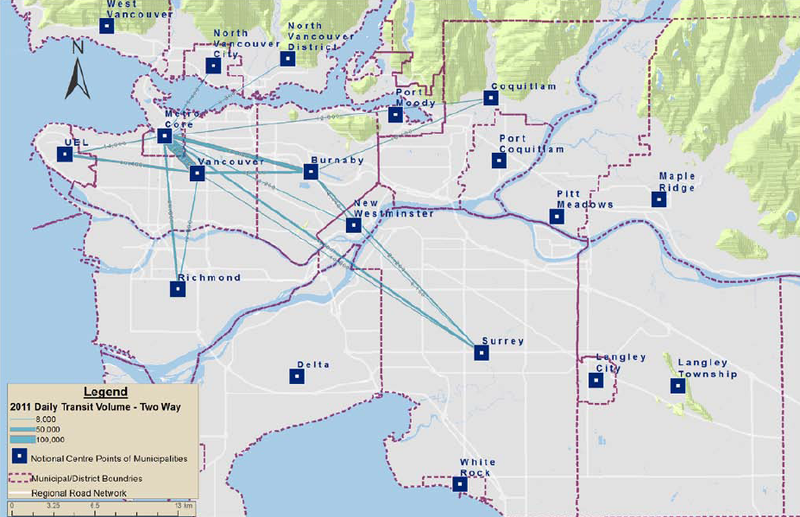 The region hopes to get more information on these companies’ plans in the fall which will help Metro Vancouver choose a provider. At the same time, Metro Vancouver is now looking for a site for the waste-to-energy facility. One on the potential sites may be in the Township of Langley. According to Metro Vancouver, waste-to-energy facilities are normally close to residential neighbourhoods in Europe, as it makes it easy to provide district energy (heating homes from the heat created by waste-to-energy). I’m sure there will be controversy surrounding any site selected in the region. Apparently a shortlist of site will be released in mid-July. Whether it is the current challenges or a recollection of the past, it seems that people in Langley are very passionate about the topic of transportation. When it comes to Langley’s early transportation network, the Township of Langley's Heritage Advisory Committee is interesting in preserving pieces of those early systems that still exist in the community today. In the latest Township of Langley Heritage Advisory Committee agenda, the committee received an article on the Coghlan Substation which is one of the two remaining B.C. Electric Interurban Substations. These substations seem out of place within their rural environment. When I first saw the substation at the corner of Vye Road and Powerhouse Road in Abbotsford, I had to take a closer look because of its unique architecture. The following video is of that site. The Coghlan Substation, located near 68th Avenue and 256th Street, according to the article by Jessica Blesch was designed in the renaissance revival style. More thought was put into its design as not only was it a substation to provide power to the Interurban system, but it was also the home of the station operator and his family. 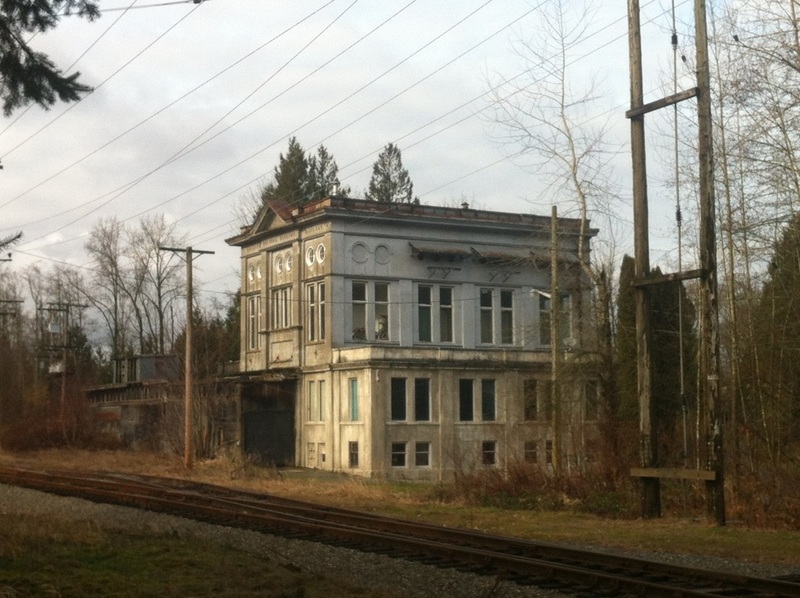 The substation also severed as a community gathering point back in the early days of Langley. Bill Underhill, who was a chief engineer for B.C. Electric at that time, built tennis courts at the substation according to Blesch as a testament to the important role the station played in community life. The article also contains information about the interurban system that once ran from Vancouver to Chilliwack. The article is part of the website vancouvertraces which hosts other articles with nuggets of history about our region. The Coghlan Substation. Photograph by Jessica Blesch. The Coghlan Substation was added to the Township's Historic Sites Inventory in 1993. The substation is in need of maintenance and is deteriorating. 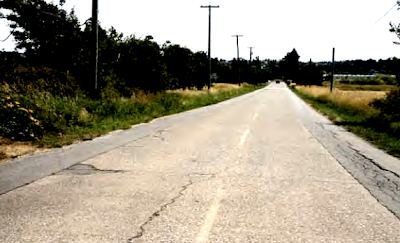 The next piece of transportation history is Old Yale Road between the five corners intersection at 216 Street, to the Langley Bypass and Fraser Highway. The route dates back to the 1870’s. This section of road was first gravelled in 1897, and in 1922 was upgraded to a hard surface with concrete segments that are still in place today. The road is in need of repair and the Heritage Advisory Committee has asked Township Council to commission a study to see what should be done to preserve the historic corridor including the possible restoration of the concrete surface and an exploration to see if the road can be enhanced through integration with the Township’s pedestrian paths and trails network. THEREFORE BE IT RESOLVED that UBCM lobby the Province of British Columbia to amend the Motor Vehicle Act to limit the default speed limit on a highway in a municipality to 40 km and allocate implementation funds to assist municipalities in installing signage for higher speeds where appropriate. The City of Victoria has already received support from the Association of Vancouver Island and Coastal Communities, and is looking to get this resolution adopted at the next Union of British Columbia Municipality Convention in September. The UBCM represents the voice of local government in BC. It’s good that the City of Victoria is spearheading the campaign to get the default speeds change, and I certainly hope that municipalities like the City of Langley can get behind this considering all the pedestrian traffic around its downtown core. Of course one of the things that this resolution does not talk about is road geometry. If you post a 40km/h speed limits on a big wide road, you will find that people will be speeding all the time. If you design the road with narrower lanes, curb bulges into the road at intersection, include curb parking, and plant trees, people will natural drive slower and the risk of a collation will be reduced. Maybe the next resolution at the UBCM should be for the Province and local governments to work on an urban road geometry standard that is safer. Back in 1996, the Township of Langley requested the removal of land from the Agricultural Land Reserve (ALR) including the 43.99 acre property located at 3250 264 Street as part of a process to provide more living space for the Aldergrove community. The Agricultural Land Commission denied the application at that time. In 2010, this parcel of land came up again for exclusion from the ALR. Township Council at the time did not support the exclusion and the request was dropped. Jump head to today, and that same parcel of land is up for exclusion support from Township Council again. The proponent is Genstar Development Company and it would like to build low-density and medium-density housing on the site. 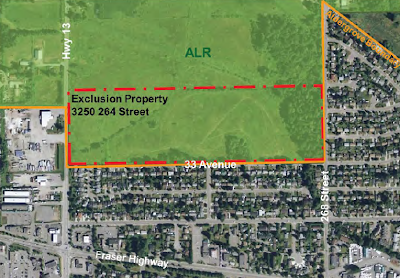 Unlike other development proposals in the ALR in the Township, this property is actually located with Metro Vancouver's Urban Growth Boundary. It would only need approval from the ALR and Township Council to allow large-scale development. Also, apparently this property was only actively farm for a short period in the 1990’s. 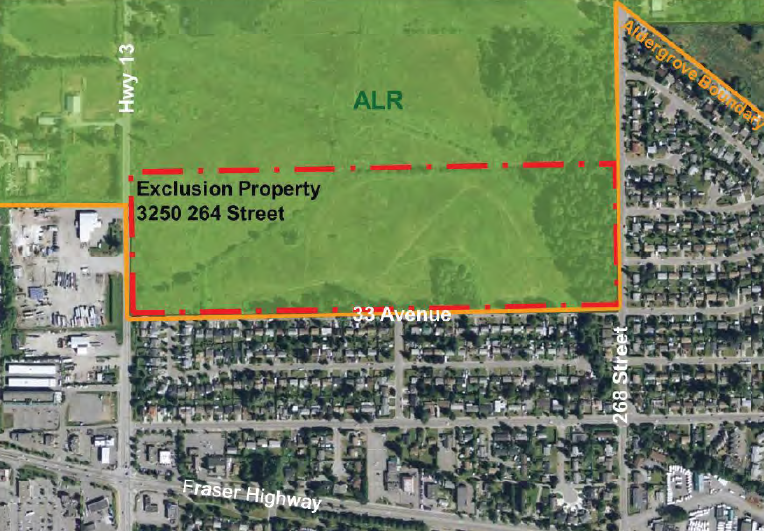 Whether or not the application to exclude this land will improve the long-term sustainability of Aldergrove, it does seem that the ALR is slowly being chipped away at in Langley. With all the land available along the 200th Street corridor, it would seem to make more sense for the Township to support building a great urban form in that corridor or in existing built-out areas, and really give a sober second thought to all other development applications. Approved University District. Click image to enlarge. 2. Commercial uses subject to identification of appropriate location and design guidelines in order to provide convenient day to day services for the existing and future academic and residential population. For a community that prides itself on the protection of farmland, approving a new community that could be larger than Fort Langley, on land that is yet to be excluded from the Agricultural Land Reserve, seems to be at odds with that point of pride. 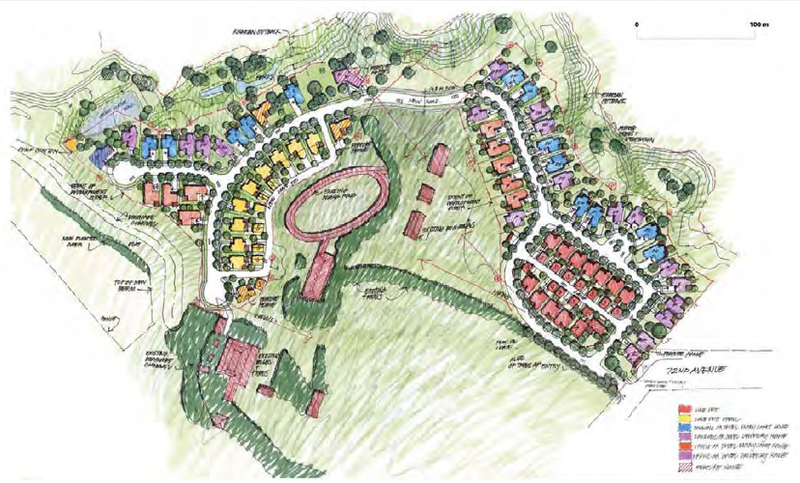 What will actually be allowed today is the development of 67 single-family houses on 13.5 acres of former farmland, and the development of 23.4 acres of land that is located to the west of the current Trinity Western University campus for university expansion. The first project that is likely to get build will be the 67 single-family houses as that land owner has been trying to build them for the last decade. Preliminary site plan of Wall Financial Corporation 67 suburban houses within the ALR. 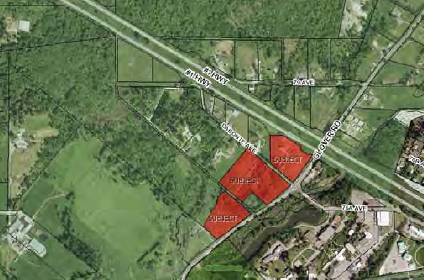 The 9.47 ha (23.4 acres) of land located at 7645 and 7679 Glover Road, and 22423 Labonte Avenue has been rezoned to Residential Institutional. 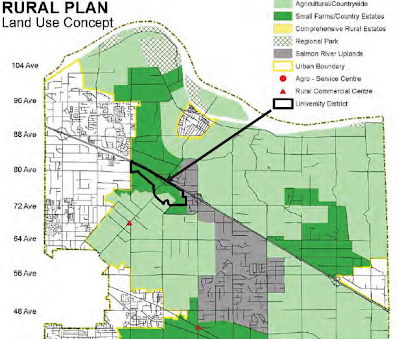 Last year, Metro Vancouver threatened to sue the Township of Langley as it believed the University District was against the Regional Growth Strategy and Livable Region Strategic Plan. It will be interesting to see what Metro Vancouver will do now that the Township has approved the University District. I have to question if the University District will meet the Township’s sustainability objectives as it will be difficult to serve with transit and won’t likely be a complete, walkable community. I predict the University District will be an auto-oriented commuter community surrounded by farmland which is not how the Township should be developing. Only a few years ago, TransLink kept a tight lid on statistics about our transit system. Maybe it’s a result of the umpteen efficiency audits that the agency has been through recently, but I’ve noticed that TransLink has become more open with the data it provides. Some of the most interesting data that TransLink now provides is from its annual bus service performance review. This will be the second year that TransLink is releasing data about its bus network's productivity. Only a few years ago, I remember being told by people at TransLink that they would only release system-wide information, and certainly would not release information on the different sub-regions. I was never sure why they had that policy, maybe they didn’t want one area of Metro Vancouver to feel like it was subsidizing service in another area. Either way, TransLink now provides bus productivity statistics at the regional, sub-regional, and individual route level. I’ve always been a fan of transparency, and I’m happy that TransLink is becoming more open. Over the past several years, TransLink has been able to increase the overall amount of bus service provided in the region, but due to the lack of new revenue streams, the agency has also been "optimizing" the bus network. This means that for each new hour of service on one route, another route will see its service cut. There are two things to note from the preceding tables. First, the introduction of the Canada Line allowed TransLink to reallocate bus service from Richmond to other parts of the region. Second, while many people think that the South of Fraser is getting shafted by TransLink, we’ve actually seen the highest growth in bus service hours in the region. The issue is simply that TransLink needs more money to build the system needed in the South of Fraser. 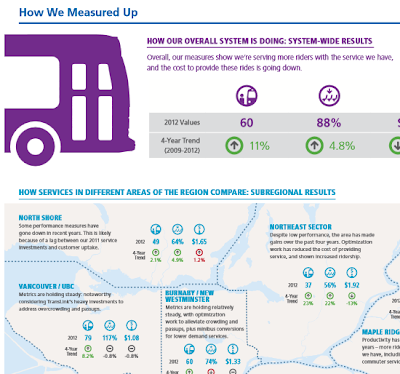 TransLink has produced an inforgraphic that explains the different metrics it uses to measure bus system performance. Click on the infographic to download in full. I briefly looked at route specific information. It’s no surprise that bus routes with 15 minute or better service in the South of Fraser are some of the most well used bus routes in the region. For example, the 319 that runs along Scott Road remained the 18th busiest route in 2012 by annual ridership, the 321 between Surrey Central and White Rock remained the 19th busiest route in the region, and the 502 between Surrey Central and my home in Langley Centre moved from the 26th to 24th busiest route in 2012. Clearly there is a demand for good transit service in the South of Fraser. It is good to see that TransLink is improving transit service in the South of Fraser, but at some point the agency will need new revenue. With the current provincial government and their promise of a referendum on transit funding, I feel a bit concerned about the future of public transit in the region. With the exception of Surrey, the Fraser Valley Regional Library (FVRL) serves all communities east of the Port Mann and Pitt River Bridges. The Fraser Valley Regional Library is proposing changes to its funding formula that will impact the cost of library services in the communities that it serves. Right now, the library system uses what they call a “True Usage” formula which was developed over 15 years ago to allocate library costs among its member municipalities. The system is based on the number of books circulated and number of customers serviced per municipality. Over the years, this system has been hard to maintain due to the accuracy of the statistics and has resulted in unstable allocation of some resources in municipalities. The FVRL is seeking approval to move to a direct funding model where municipalities pay for the service that they use or by a per capita funding formula. Proposed changes in library charges for FVRL member municipalities. Click table to enlarge. As the proposed changes are not meant to increase the total budget of the FVRL, some communities will pay more and others will pay less. Interestingly enough, both the City and Township of Langley will be paying more for library services. 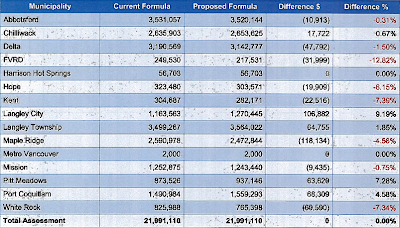 The City of Langley is the biggest “losers” in this funding formula change as its library costs will go up 9.19% or $106,882 to $1.3 million, and The Township of Langley will also see a 1.85% or $64,755 increase to $3.6 million if these changes were implemented in the 2013 budget. Trying to figure out what to do with the aging Pattullo Bridge has been on TransLink's agenda since the agency took over control of the structure almost 14 years ago. Back in 2008, TransLink started to seriously consider replacing the bridge and commissioned the firm Delcan to study replacement options for the Pattullo. The recommendation from Delcan in 2010 was to replace the bridge with a new 6-lane facility immediately upstream from the current one. In 2010, TransLink was still planning to build the North Fraser Perimeter Road through New Westminster which would have resulted in a four-lane corridor from the Queensborough Bridge through Untied Boulevard to the Pitt River Bridge. In 2011, New Westminster opposed the North Fraser Perimeter Road and it was effectively cancelled. This called into question the need for a 6-lane Pattullo Bridge. The since cancelled North Fraser Perimeter Road. Click image to enlarge. TransLink still continued to pursue the 6-lane replacement option for the Pattullo, but as time went on, it became increasing clear that the City of New Westminster was not interesting in a 6-lane bridge and the associated traffic that it would bring to the community. This caused TransLink to push the reset button on the whole Pattullo Bridge replacement project. TransLink is now working with the City of New Westminster and Surrey to evaluate replacement options for the Pattullo. TransLink, New Westminster, and Surrey have launched a new consultation website and are holding open houses and small group meetings through the month of June. They have also posted consultation material online and are accepting online feedback until June 28th. On the table now are rehabilitating the Pattullo Bridge as a 3 or 4 lane facility for a cost of $330 million to $400 million; replacing the Pattullo Bridge with a new 4 to 6 lane facility for a cost of $820 million to $1.1 billion; or build a new 4-lane Surrey/Coquitlam Bridge and rehabilitate the Pattullo Bridge as 2 or 3-lane facility for a cost of $1.4 billion to $1.5 billion. 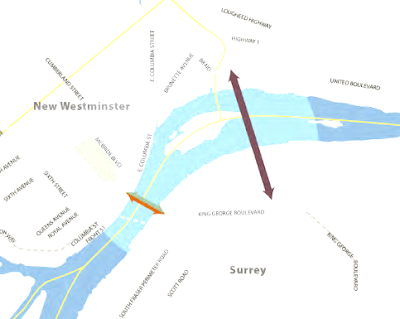 The location for a proposed 4-lane Surrey/Coquitlam Bridge. One of the more interesting options is to build a new 4-lane Surrey/Coquitlam Bridge combined with a rehabilitated Pattullo Bridge. I have to wonder if this recommendation is a result of New Westminster effectively cancelling the North Fraser Perimeter Road. 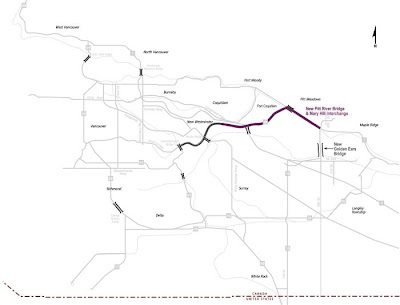 It looks like the new bridge would shunt truck traffic from United Boulevard to the South Fraser Perimeter Road, providing the trucking link that the NFPR was supposed to do. I think that the Pattullo Bridge should be replaced with a new 4-lane facility as it would meet the safety goals of replacing a bridge that is near the end of its useful life. The consultation process will continue into 2014. It is expected that a preferred alternative will be select in the winter of 2014. Building walkable neighbourhoods that include a variety of housing options, shops, and services is something that I believe we need to do more of in Langley and the South of Fraser if we want to have an accessible region and “Age-Friendly” communities. As I’ve talked about recently, there are currently only a few walkable areas in Langley including Downtown Langley, Fort Langley, and Aldergrove. In walkable areas like these, and when building new walkable areas, should the private automobile be accommodated? Unless you happen to be in some very select neighbourhoods in the world, the private automobile has to be accommodated. Back in the mid-20th Century, many communities tried creating pedestrian-only high streets which pretty much killed them overnight. Clearly accommodation must be made for the automobile which inevitably leads to a conversation about parking. Surface parking lots are a sure-fire way to kill a walkable and accessible community, so how should vehicle parking be accommodated? There are really only two options: on-street curb parking and parking in structures (ie: underground or in a parkade*.) As much as possible, access to structured parking should be from a lane as to not interrupt the public realm. Many of the more residential neighbourhoods in Langley are starting to build this way, but this is not really happening in commercial areas. Besides shifting parking to on-street or in a structure, a community must evaluate its parking pricing policies. As the saying goes, nothing is free, and that includes parking. If you are not paying for it upfront, you are paying for it with every economic transaction you make. Donald Shoup, a Distinguished Professor of Urban Planning at UCLA, explains this in his seminal work The High Cost of Free Parking which I believe every Business Improvement Association and every municipal councillor should read. Shoup's basic idea is to put a user-fee on parking. For commercial areas, the price should be such that there is always an available parking spot on each side of a block as well as parking available in structured parking. With modern technology, parking providers can have real-time information on parking demand and can adjust the price of parking in response. For example, it might cost nothing to park on a Sunday morning, but on a Friday night, it might cost $1.00 per hour. With this in mind, time limits on parking can be eliminated too. Some business owners might think that paid parking will kill their business. This couldn’t be further from the truth. Smart paid parking policy will actually improve business and the economic well-being of commercial areas. The fact is that having no parking available is what drives customers away. For case studies on this, I suggest reading Walkable City by Jeff Speck. Locally, the City of Surrey has recently implemented paid parking in Netwon Town Centre. Businesses were resistant when it was introduced, but now they see the value. What would this look like in Langley? Well for starters, I would introduce paid parking for on-street parking in Downtown Langley, Fort Langley, and Aldergrove. In Downtown Langley and Fort Langley, I believe a serious conversation needs to happen about building a common structured parking facility. These polices would free up surface parking lots for a higher economic value, help support walkability, and ensure there is always parking available. *As long as the parkade contains retails on the ground floor. If you read this blog regularly, you may have come to the conclusion that I’m not a big fan of auto-oriented urban development or freeways. While this would be true for the most part, I do understand that some businesses and Port Metro Vancouver rely on a good rail, water, and road network. These businesses and the trade from Port Metro Vancouver provide good jobs for people which is important for maintaining a livable region. Besides my health, social, and accessibility concerns, my main concerns with auto-oriented development and freeways in Metro Vancouver are twofold. First, I believe that we have overbuilt our road network at a great cost because unlike every other limited resource, we do not pay a direct user-fee to use it. Placing direct user-fees on certain congested roads in the region would reduce congestion, reduce GHG emissions, and help support businesses and trade that rely on predictable travel times; all without having to spend a large amount of money on endless expansion. User-fees have been proven effective in helping people make smart travel choices all over the world and even in Metro Vancouver (crossings are down at the Port Mann and have been lower than expected on the Golden Ears). Because various levels of government have spent large sums of money on roads, this has left less money available to invest in walking, cycling, and transit infrastructure. I’ve always believed that most people in Metro Vancouver, given the choice, would want to optimize our existing road network and invest in walking, cycling, and transit infrastructure as opposed to building more freeway. Not surprising, the number one challenge for the region as identified by the survey participants was the provisioning of health care. The number 2 issue was around traffic congestion. Interestingly enough, traffic congestion was the number 4 issue for people who live in Vancouver and 3 issue for people who live in Burnaby, but the number 1 issue for people who live in places like Langley and Surrey. It seems that in places where there are not good alternatives to driving, congestion ranked as more of a concern. The expansion of highway was ranked at number 9 of 11 priority policies. In Langley and Surrey, the top priority policies for survey participants were to expand public transit, making more efficient use of the present transportation network, and stimulating economic development. Preserving the natural environment was ranking higher than expanding highway, even in Surrey and Langley. This survey confirms my gut feeling that people in the South of Fraser want more public transit, would be willing to pay a user-fees for a more efficient road network, and aren’t two crazy about building more highways. I believe the Province should introduce road pricing/tolls on all major highways in Metro Vancouver and use these fees only to maintain the road network and expand transit. Gas taxes could then be lowered as a result. With proper alternatives to driving and road pricing, traffic congestion would reduce overnight. Sadly, the Province is still in the 1960’s when it comes to transportation planning and while the region wants more transportation options, the Province seems to only want to build more freeway. The City of Langley has published its 2012 Annual Report online. This report contains information about the progress the City has made in meeting some of its corporate goals as well as its audited 2012 financial statements. The City's key result areas are in infrastructure and economic renewal, providing a high quality of life for its residents, being accountable, and protecting its environment as well as its people. To that end, the City highlighted the recent implementation of the city-wide kitchen organic waste collection for single-family homes. The City also mentioned the introduction of free public WiFi in key areas in Downtown Langley. On the infrastructure side, the City highlighted the Roberts Bank Corridor Program that is building the 192nd Street overpass, 196th Street overpass, and an east-west connector on 54th Avenue. The Annual Report also notes some of the new private development projects in the City. Finally, the City talked about many of the plans that it is working on including the updating of its Master Transportation Plan, and Park, Recreation, and Culture Master Plan. 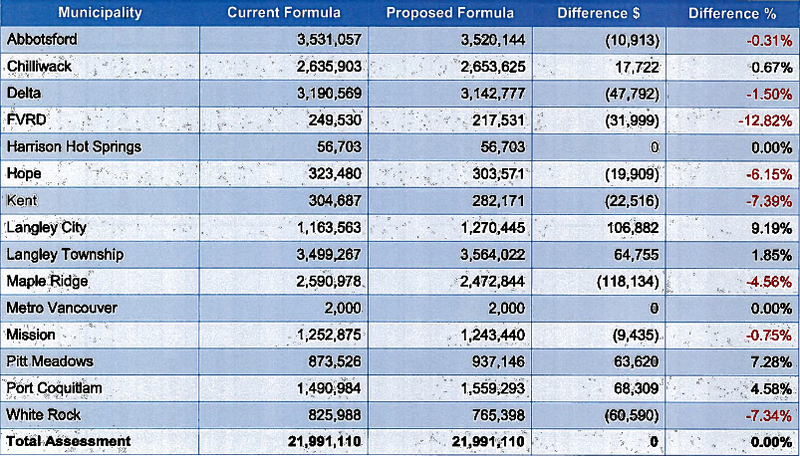 On the financial side, the City was under-budget in 2012. The City predicted revenue of $42.7 million for 2012, but collected $44.1 million. The City planned $39.2 million in 2012 operating expenses, but spent $37.2 million. The only area where the City didn’t meet its budget target was for recycling and garbage collection which was likely due to the introduction of kitchen organics collection and the resulting renegotiation of waste/recycling/organics collection in the City. One of the interesting things I found was that City taxpayers contributed $2.84 million to TransLink in 2011 and only $2.79 million in 2012. The City will be holding a public hearing on Monday, June 17, 2013 at 7:00 pm in Council Chambers for people to provide feedback on the report. More information is available on the City’s website. Following up to my last post about travel patterns in Metro Vancouver, I thought I’d post two maps that show which municipalities people travel between in our region. As I noted last week, the vast majority of trip that people make don’t even leave their home municipality. 2011 Transit Trips between Municipalities. Source: 2011 Metro Vancouver Regional Trip Diary Survey - Analysis Report. Click Image to Enlarge. Looking at the transit mode trip pair volumes map, it becomes obvious that transit captures a large amount of trips that head towards Vancouver along rapid transit lines. Most trips between municipalities in the South of Fraser are by car, and transit doesn’t even register on this map. 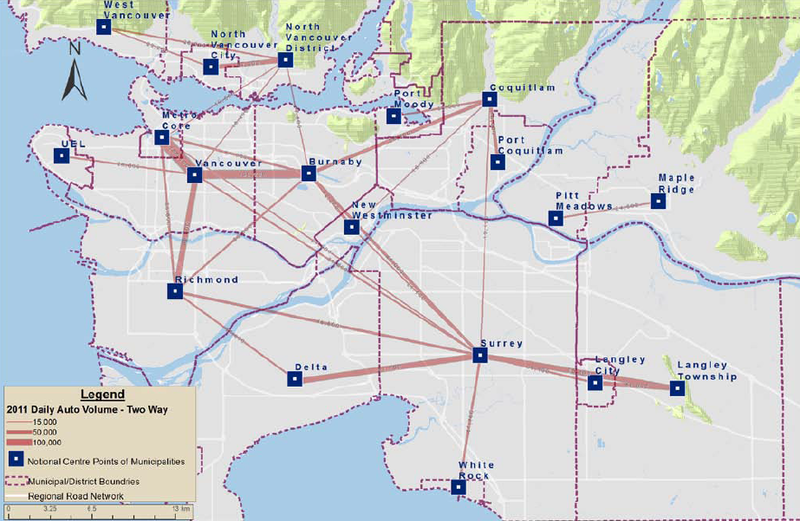 The current South of the Fraser Area Transit Plan recognizes that the transit system in the South of Fraser is setup to get people to Vancouver, and lays out the steps needed to change the system to service local needs better. Of course the lack of transit funding has limited the ability of TransLink to full implement the plan. The next map shows the auto mode trip pair volumes in our region. It is interesting to note that the Province and TransLink has spent billions of dollars on bridges that doesn’t serve the clear majority of trip in our region that are intra-municipal, and don't even serve the majority of inter-municipal trips. 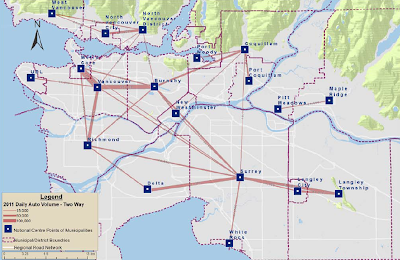 It seems that Richmond/Vancouver/Burnaby is one strong cluster of inter-municipal auto trips, and Delta/Surrey/Langley is another cluster of inter-municipal auto trips. 2011 Auto Driver Trips between Municipalities. Source: 2011 Metro Vancouver Regional Trip Diary Survey - Analysis Report. Click Image to Enlarge. At the end of the day, it seems what would help people the most would be to invest in transportation infrastructure that helps people get to places within their communities and within their sub-regions. If we consider that there is very limited space to expand roads in municipalities and that building freeway would not meet the sustainability objectives of our region, it would seem that the best bet would be to invest in walking, cycling, and transit in our communities. Unfortunately, it seems that the Provinces isn’t paying attention to this data or the region’s goals for transportation.